I’m no great fan of the national capital [photo: Sam Ilic] though I like its architecture. I’ve only been to Canberra a couple of times and the closest I’ve come to staying there was a night across the NSW border in Queanbeyan. I found the capital an elegant but cold and dull place removed from the mainstream of Australian life. Walter Burley-Griffin’s creation is a work of architectural brilliance without soul. In a country with a coastal culture, Canberra is an inland fish out of water. The site of the capital was a Federation issue and Canberra was the compromise between Sydney and Melbourne. In the last 50 years Sydney has outranked its Victorian rival in most metrics and is Australia’s only truly global city. If we were deciding on a capital today, Sydney would be the obvious choice (we should get rid of the useless states while we were at it). Yesterday Peter Martin blogged about Keating and Fraser arguments about Canberra as the Australian national capital. Martin linked to a Laurie Oakes article in which Paul Keating said the capital should be Sydney. Melbournian Malcolm Fraser can’t quite bring himself to agree. However he told Oakes the new parliament house was his worst mistake as Prime Minister. Oakes said Keating was “possum-stirring”. According to the Australian Dictionary of Colloquialisms, possum-stirring means to liven things up, create a disturbance; raise issues that others wish left dormant. There are plenty of people who wish the Canberra capital argument remains dormant. Most have a strong Canberra connection, including Oakes. Nine’s federal political reporter is not happy about the alternative. He said Sydney should not be the capital because of corruption and lobby groups. “Our federal politicians and senior bureaucrats would all then live among, mix with and be constantly influenced by the same log-rollers, urgers, developers, greedy business people, lobbyists, shysters, corrupters and crims who have made NSW politics such a cesspit,” said Oakes. However a three hour drive is not going to stop someone from trying to corrupt a federal politician. Martin is also in the negative camp and said Keating and Fraser were wrong to call Canberra a mistake. He agrees with former Canberra Times editor Jack Waterford who said “opposition to shifting the Australian capital to Sydney or Melbourne would be even more fierce today than it was 110 years ago.” But would it? No one cares outside vested interests in Canberra such as Oakes, Martin and Waterford. Labor PM Kevin Rudd’s home town Brisbane is too much of an outlier to host cabinet meetings on a regular basis but it is not hard to imagine the next Sydney Prime Minister – whoever he or she might be – going back to the Howard precedent. Canberra need no longer be a waste of a good sheep paddock. Australia is not alone in quarantining the capital from the largest city. There are 35 such capitals worldwide at the time of writing according to Wikipedia and the list is growing. Abuja (Nigeria) and Astana (Kazakhstan) both became capitals in the 1990s. In 2006 Burma shifted its capital from Rangoon to the remote hillside town of Naypidaw so paranoid military rulers would feel more secure. Washington DC and Ottawa are closely related but the capital Canberra has most in common with is Brasilia which arose from post-war presidential designs to inherit the Brazilian capital from Rio in 1960. A similar cool air infects Canberra. Frank Moorhouse says he likes the city and its culture because it has a “Scandinavian aesthetic rather than a Mumbai aesthetic”. But this, like the massive freeways of Brasilia, is a 20th century aesthetic. The museums can stay in Canberra but on environmental grounds the parliament should move closer to the people it serves. Outgoing Australian Press Council chair Ken McKinnon has used his final annual report (pdf) to blast News Ltd newspapers for poor editorial standards and over-reliance on stories with single sources. McKinnon also took a swipe at the industry for its APC budget cuts and the view its work could be replaced by the Right to Know Coalition. McKinnon has finished up after nine years and hands over a reduced council to new chair Julian Disney. Disney will work with a fifteen-member board (down from 22 but more than the 12 the industry wanted) but funding is still tied to industry approval so his independence is undermined. Margaret Simons in Crikey thinks this may be the start of a new battle between the industry and its regulatory body. She says annoyed public committee members chose the “social activist and reforming lawyer” Disney to counteract the arrogance of News Ltd pushing the Right to Know Coalition alternative. Simons says the other issue is the power of News Ltd editors. Although these editors understand the business of news, they tend to be arrogant and gung-ho leading to errors of judgment. “The Press Council is far from perfect,” said Simons. “But how bad does it look for the industry to back away from even its gently-gently approach, while also arguing for reduced government intervention?”The idea for press councils dates to the American Hutchins Inquiry and British Royal Commissions in the 1940s. These led to the notion of the social responsible press in the US and UK. Similar grumblings in Australia led to a journalists’ code of ethics but media organisations were loath to accept any accountability agencies. Although the unions pushed for a press council, proprietors support of the long-running Liberal government of the 1950s and 1960s ensured nothing got done about it. It wasn’t until 1975 when the Whitlam Government began preparing legislation to create a statutory press council, that the APC was founded grudgingly. The council had union delegates but the owners had the majority – and the funding. The Council has no legal authority apart from its own constitution. News Ltd initially refused to join. In 1979 the APC upheld a complaint against Murdoch because his Adelaide Advertiser was so biased against Labor in the state election that year. As Julianna Schultz says in Reviving the Fourth Estate, by the mid 1980s they were inside the tent and self-interest ensured the council had acquired the reputation of a defender of fourth estate values. But the APC could never shake off its reputation as an industry lapdog. In 1991 Kerry Packer told parliament the APC was “window dressing”. The union called it the “publishers’ poodle”. And former Sydney Morning Herald editor David Bowman wondered how it could serve the public when it was dominated by the publishers. Yet as McKinnon’s criticism hints and its statement of principles attest, the APC is a watchdog with potential bite. It has two broad principles. Firstly, the freedom of the press to publish is the freedom and right of the people to be informed. It is an essential feature of a democratic society. Secondly, press freedom is important because of its obligations to the people not the media. Public interest is foremost when dealing with complaints. In his 1984 The Media, Keith Windschuttle said there were two reforms that emerge from these principles. Firstly is the need to keep the press honest and maintain standards of accuracy and fairness (something he said the Press Council was set up to achieve). The second is institutional reform of the media. The 1979 Norris Inquiry into Melbourne’s press (after Murdoch’s failed bid to win the Herald & Weekly Times) found two dangers with media concentration: loss of diversity and too much power in the hands of too few. Norris recommended an independent authority scrutinise media share transactions to prevent further concentration. The Inquiry was a failure. No such authority was set up and Murdoch eventually got his hands on HWT empire. The refusal of the APC to deal with this matter caused the journalists union to quit the council in 1987. They returned 18 years later and handed off all journalist complaints to the APC. As union boss Chris Warren said in 2004 “the press council can deliver something we can’t, which is a published correction”. Their return adds weight to the APC claim it represents the entire print industry. The more regulation-heavy broadcast industry never signed up. The APC is nominally independent and funded out of newspaper profits whereas in broadcasting there are mandatory licencing requirements dished out by ACMA. Windschuttle wrote The Media as his politics were changing from left to right. He offered a laissez faire response to regulation which the proprietors would prefer. They believe the press are in the business of telling the news and owe nothing to the people it serves. The APC is pre-disposed towards the market system with “light touch” regulation. But as media scholar Robert McChesney notes in Communication Revolution, no one ever voted for a market-based press subsidised by advertising. Newspapers remain the most important media for original investigation and reporting. However as Michael Schudson notes, Wall Street’s collective devotion to an informed citizenry is nil and newspapers are going to the wall. McChesney was talking about the American scene which has no strong public broadcaster as a counterweight but many of his lessons are transferable to Australia. In McKinnon’s final report, he discusses issuess for local media: Internet clean feed, secrecy laws, the right to publish school “league” tables, FOI, the Bill of Rights, privacy, protection of whistleblowers, court reporting, and many others. McKinnon reminds us of Article 19 of the Universal Declaration of Human Rights to which Australia is a signatory: “Everyone has the right of freedom of opinion and expression”. McKinnon distils this into a “charter of a free press in Australia”. The people, he says, have a right to freedom of information and access to differing views and opinions. This is a direct attack on News Ltd’s attempt to monopolise news in Australia and a worthy watchdog’s attempt to bite the hand that feeds it. With the combative Disney in the chair, the social justice angle of the APC will get stronger. At a critical juncture for the media, expect this battle to get more heated. An hour and a bit’s drive south of Brisbane lies the Laser lighthouse. 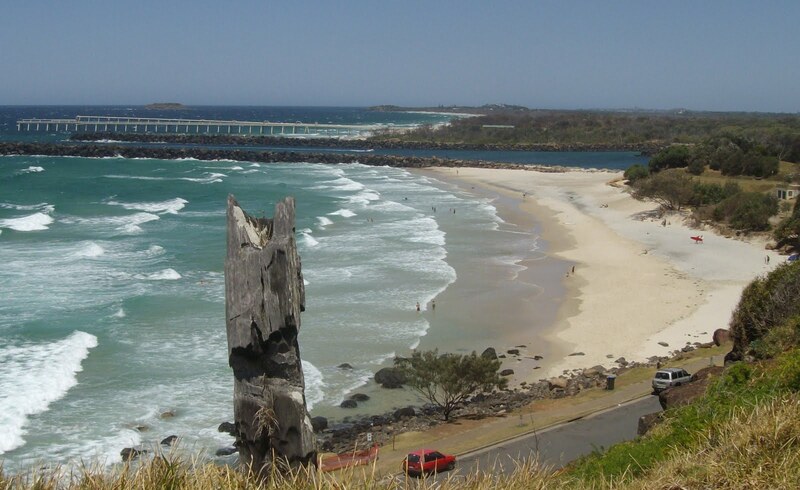 The lighthouse is on the border between Queensland and NSW on the tip of Point Danger in Tweed Heads, NSW, a stone’s throw up the hill from Coolangatta, Qld. 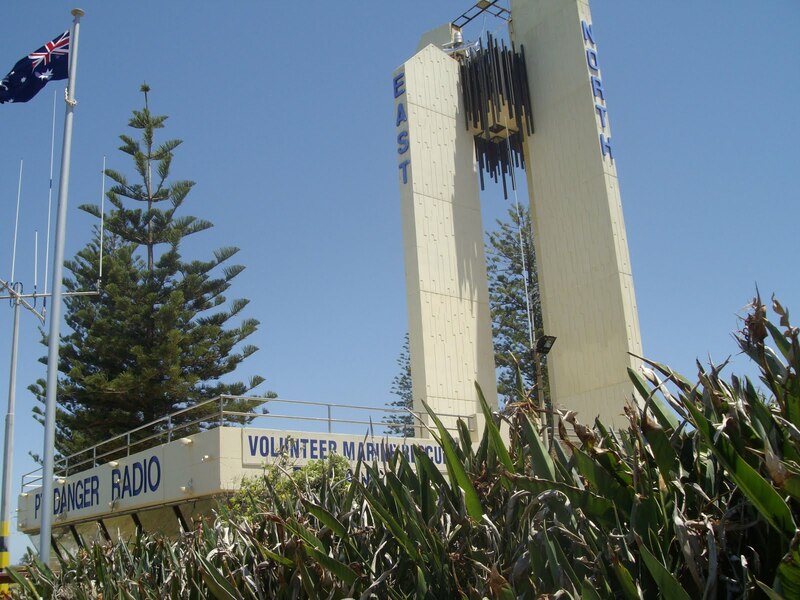 The Captain Cook Memorial lighthouse was the first of its kind commissioned in go-ahead development days of 1971. But the laser technology was unsuccessful and it returned to conventional mirrors four years later. This is the mouth of the Tweed river south of the lighthouse. The Tweed is not quite on the border but in most people’s mind is the definitive line where Cockroaches end and Canetoading begins. The river begins in the massive caldera of Mt Warning which blew its enormous stack 23 million years ago. 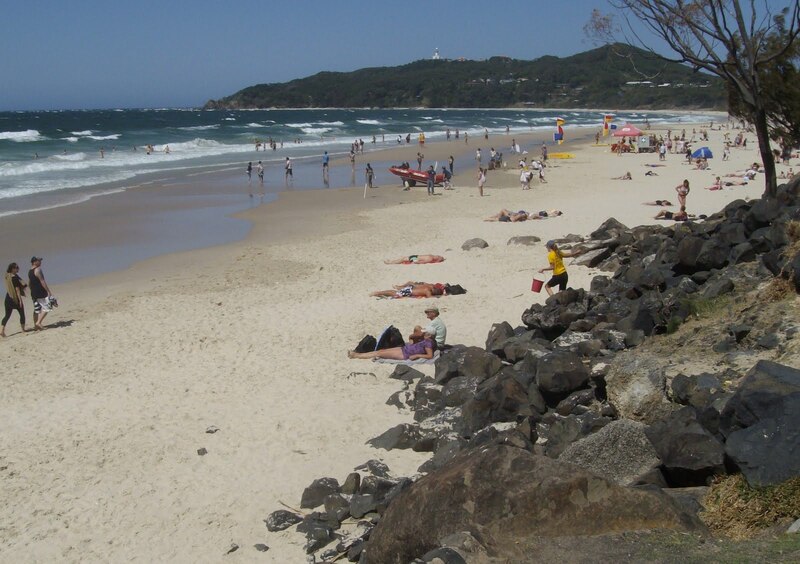 Another 80km south is Byron Bay. The population is supposedly 5,600 but the tourist traffic makes it seem a lot busier. 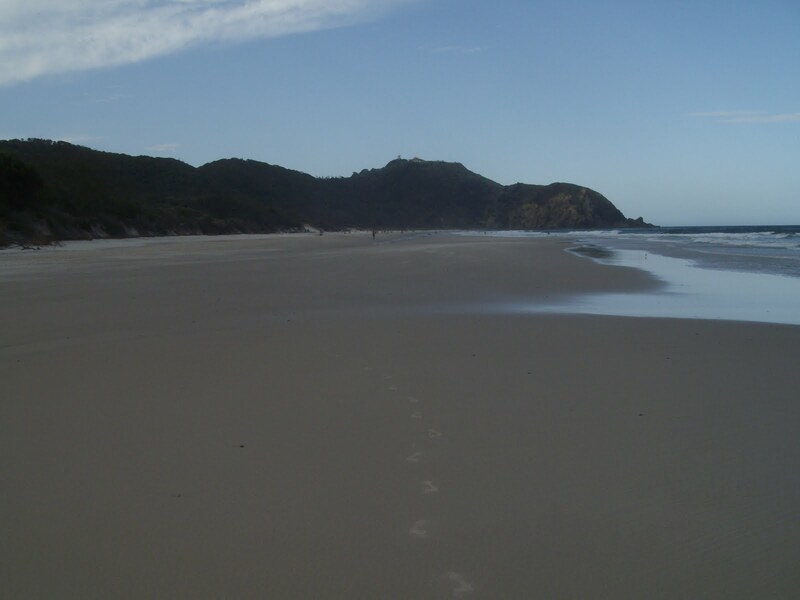 A long-time Aboriginal settlement, Captain Cook gave its English name in 1770 when he found safe anchorage at what he called Cape Byron. This Byron was John Byron an Englishman had circumnavigated the world. He was the grandfather of the more famous poet Lord Byron. 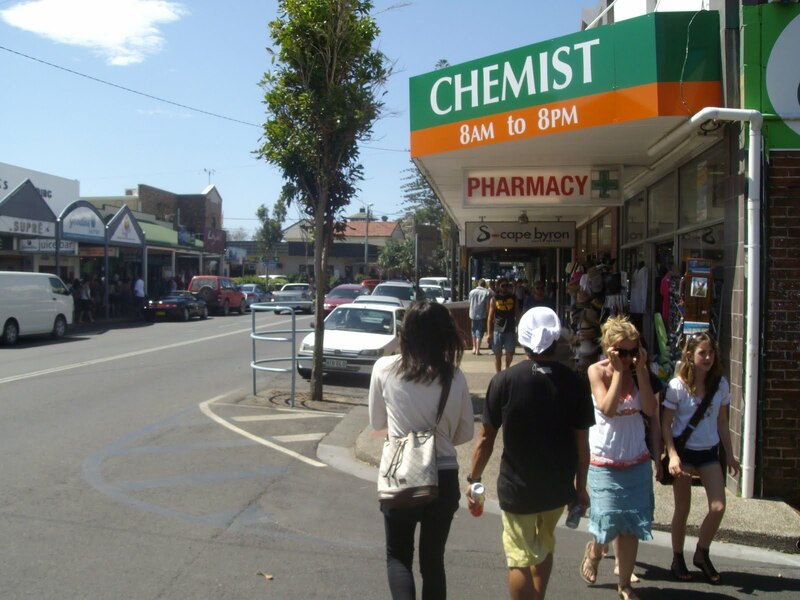 Today Byron is a compulsory stop on the backpacker route north from Sydney. 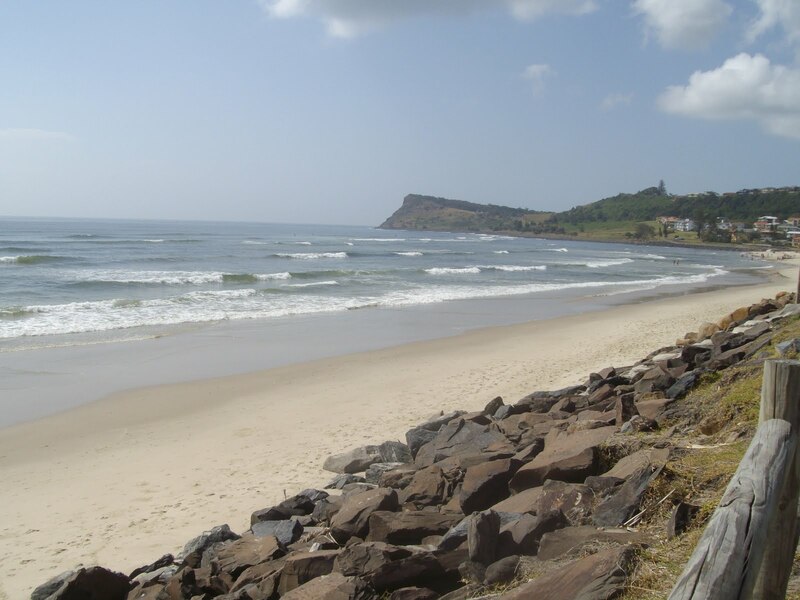 Most people come for the beachlife and the renowned surf. 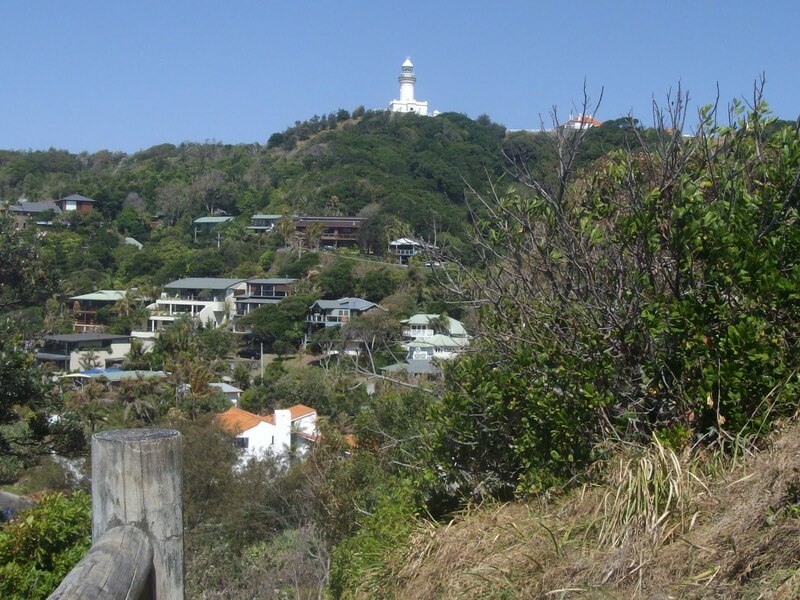 Byron’s most prominent feature is the white lighthouse built in 1901 at the most easterly point on the Australian mainland. 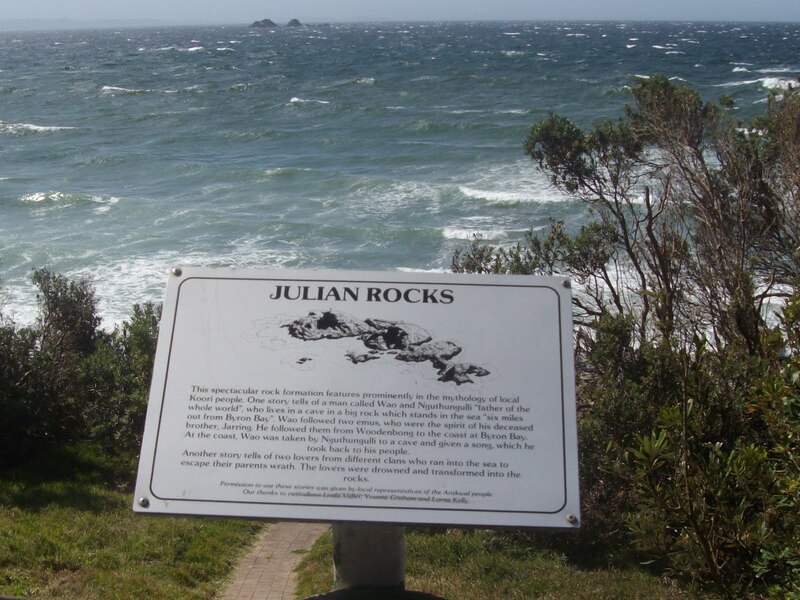 Captain Cook also named Julian Rocks in a later voyage in 1776. The two main peaks are named for his nephew Juan and niece Julia. They are remnants of an ancient volcanic eruption more than 20 million years ago. They were established as a marine reserve in 1982 after 10 years of lobbying. The Rocks are one of Australia’s top dive spots a marine reserve, providing shelter and food for more than 500 tropical and temperate fish species. 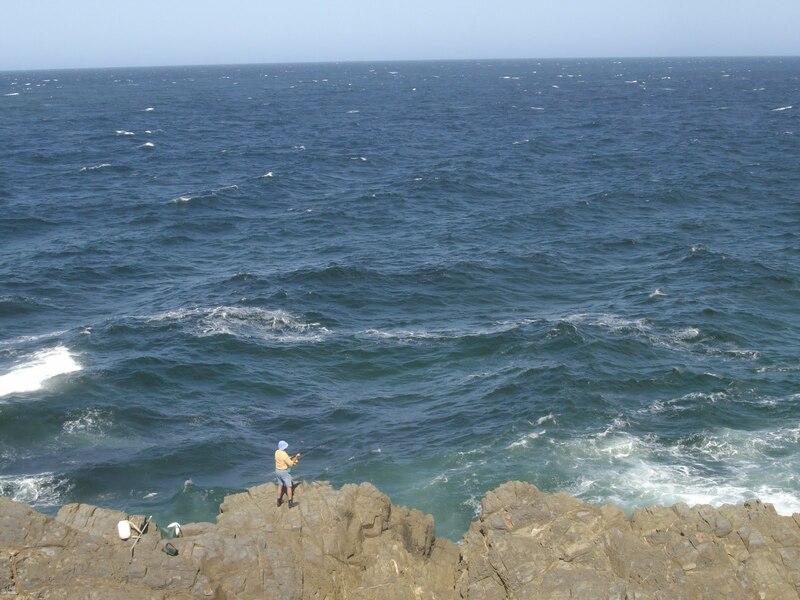 This precariously placed fisherman is hoping some of Julian Rocks marine life has strayed close to the mainland. 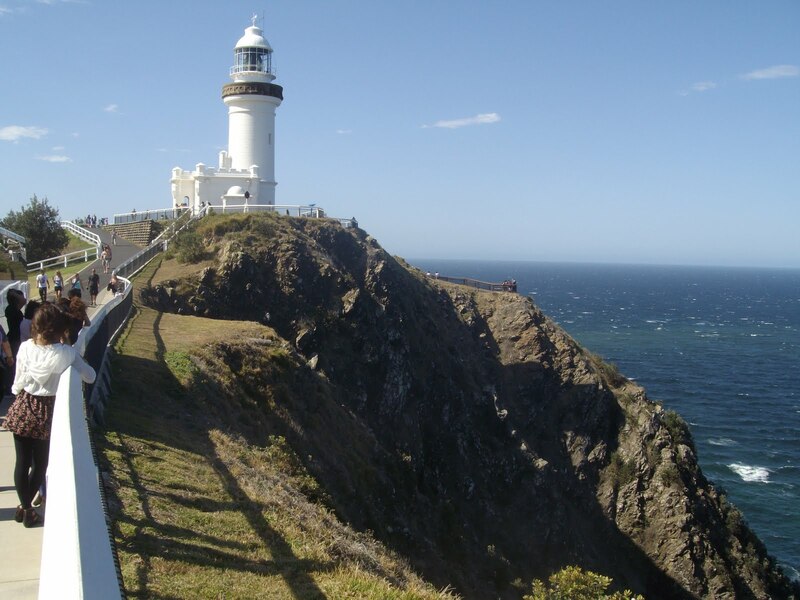 Cape Byron Lighthouse was built in 1901 (year of Australian Federation) from prefabricated concrete blocks in the style of New South Wales colonial architect James Barnet, by Barnet’s successor, Charles Harding. The eight ton optical lens was made by the French company, Societe des Establishment, Henry Lepante, Paris and contains 760 pieces of highly polished prismatic glass. The light is Australia’s most powerful. 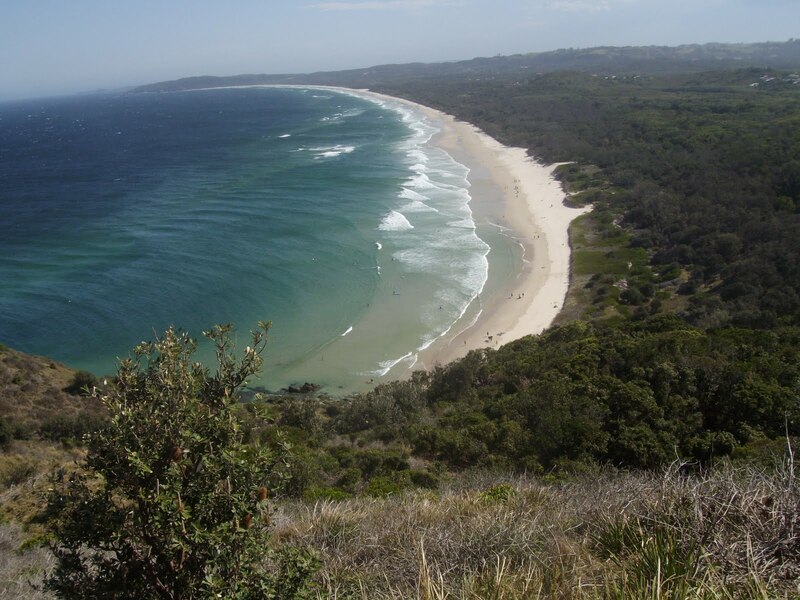 Beautiful Tallow beach lies due south of Cape Byron facing eastwards. 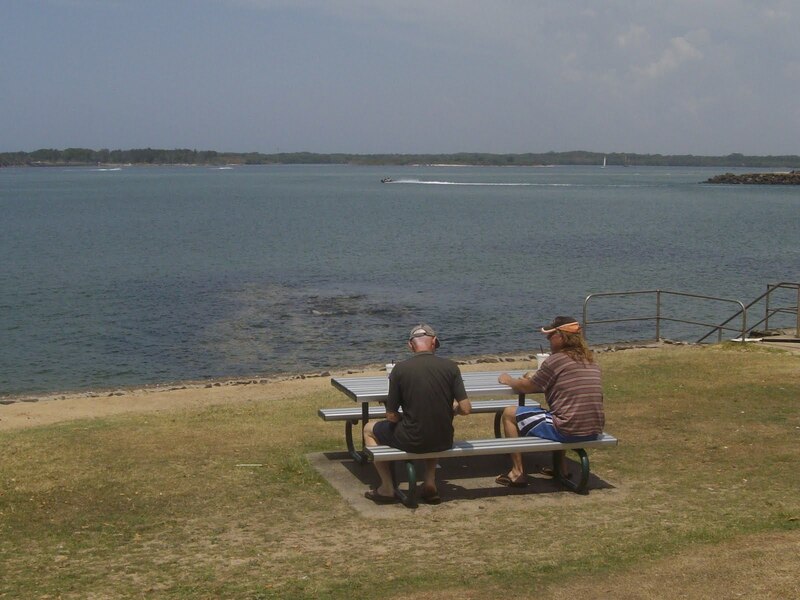 About 20kms further south is Lennox Head. 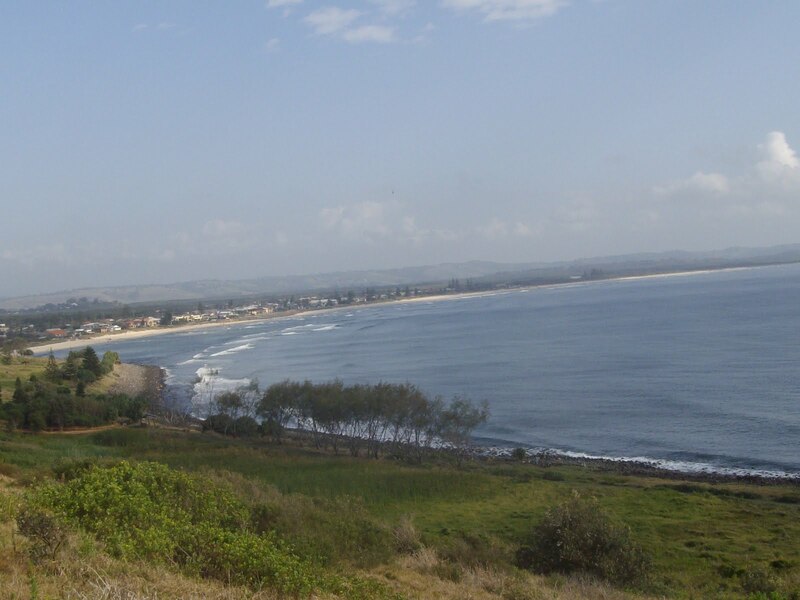 This is the view to the township and Seven Mile Beach from Pat Morton lookout south of town. 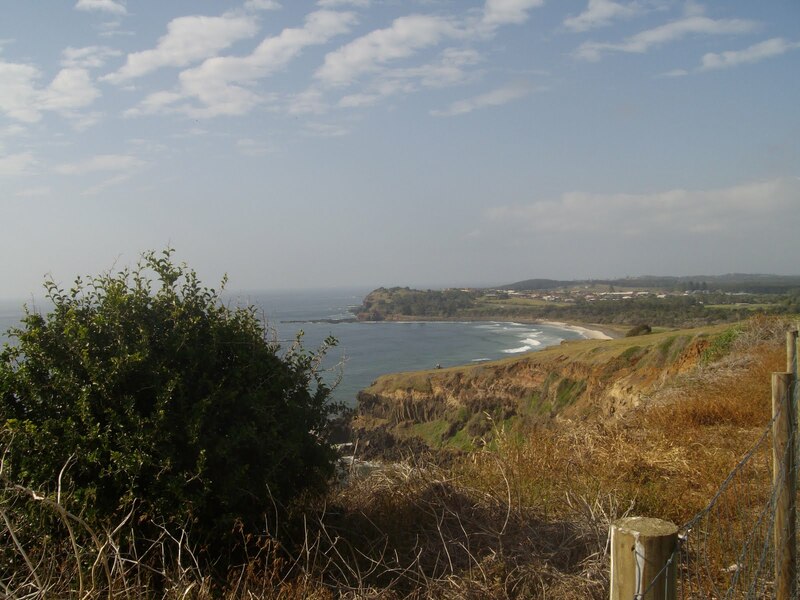 This is Lennox Headland from Lennox Head. 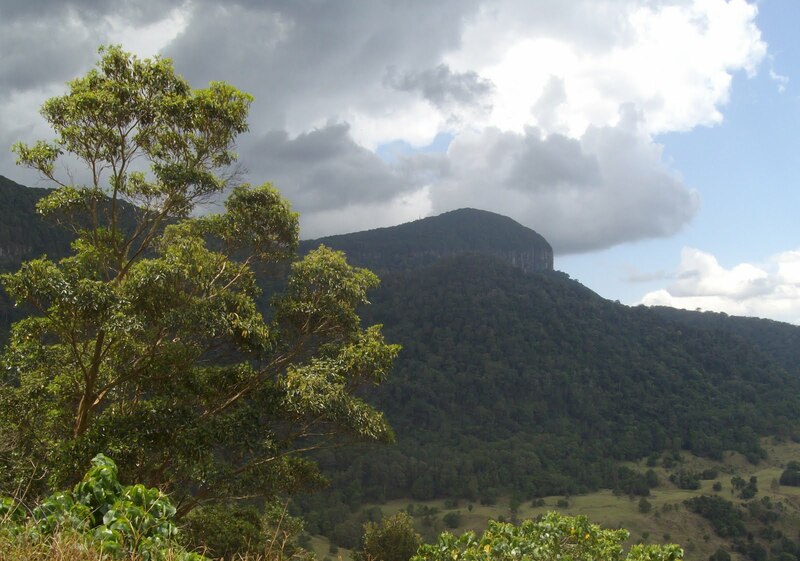 It was formed from the same eruption 20 million years ago that carved out Mt Warning. 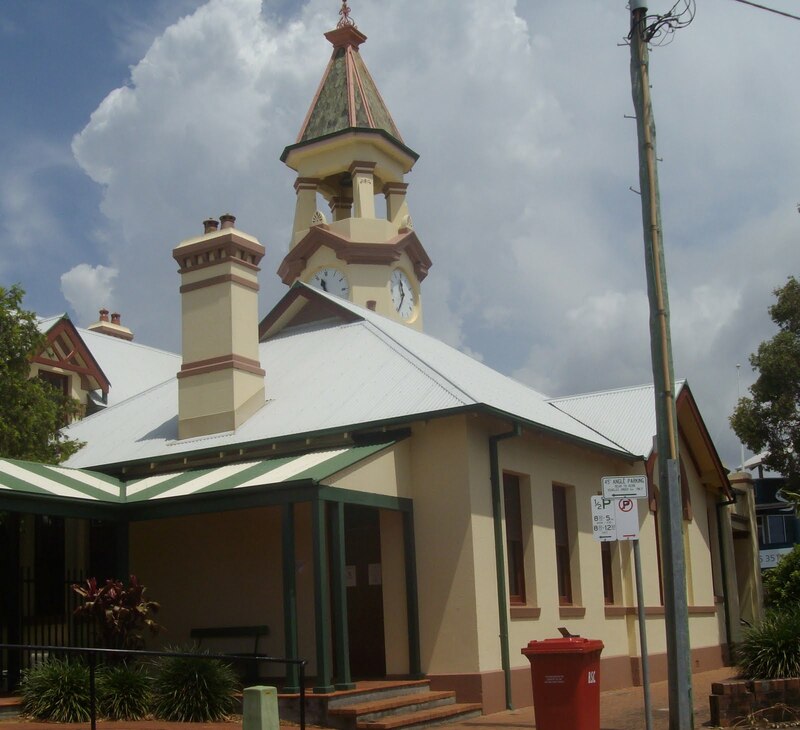 Town Hall, Ballina, Seat of Ballina Shire council. I used to think that Ballina (with the stress on Bal’-lina) was named after the County Mayo town of Ballina (with the stress on Ballin-ah’) but apparently it is an Aboriginal word meaning “place of many oysters”. Irish settlers in the area were happy with the dual meaning. 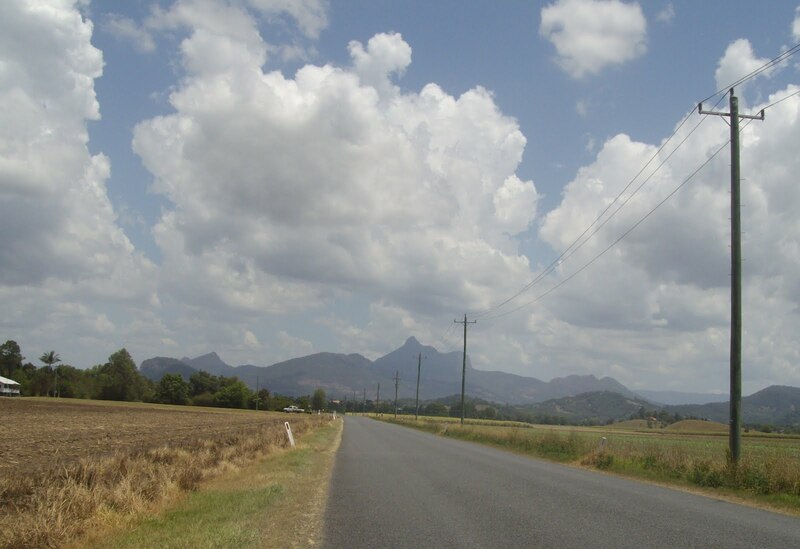 A view of Mt Warning itself from the Murwillumbah-Nerang back road. Because of its height and proximity to Byron, Mt Warning gets the first light on mainland Australia. Cook named it in 1770 as “a remarkable sharp peaked Mountain lying inland” that warned him of the dangerous reefs near Fingal Head. 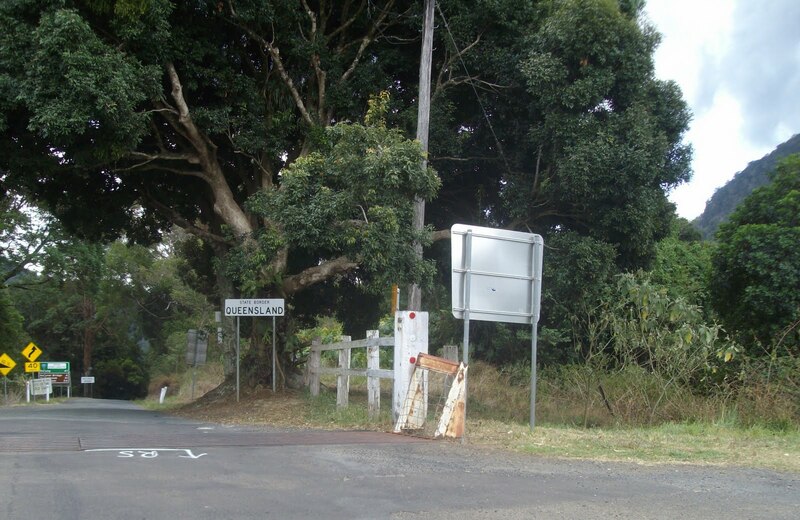 The border post on the lightly-used Murwillumbah-Nerang back road. Queensland’s Coordinator-General Colin Jensen has approved the building of a $35 million controversial shaft in Wooloowin to ensure the $5.6 billion Airport Link tunnel is completed on time. Jensen’s decision was in response to a change request to address potential adverse impacts of the Wooloowin tunnel worksite. The decision means tunnel builder Brisconnections can begin construction of a shaft 15m in diameter and 42m deep on vacant land at the corner of Kent and Rose streets, Wooloowin. The problem arose when difficult ground conditions around the Kedron underground ramps meant extra work to construct more complex tunnel support. Without the change the Kedron caverns providing for the ramp connections with the mainline tunnels under Wooloowin would not be built in time to receive the Tunnel Boring Machines progressing westwards from Clayfield. Brisconnection’s solution was for a 29-month-long worksite to be built at Rose St with a large acoustic workshed, a shaft and access passage and a fitout of the tunnels when constructed. Brisconnections’ change request to the Coordinator-General on 17 July resulted in 163 public submissions. The main issues arising from the submissions were: the change reason wasn’t abundantly clear, concerns about traffic and transport impacts, concerns about large trucks, environmental and social effects, and decommissioning and rehabilitation. These concerns were also cited by community action groups. Jensen noted three major potential impacts: construction impacts, spoil haulage (construction traffic), and visual pollution from structures such as the acoustic shed. Jensen recommended the worksite time be minimised, the formation of a community consultation committee, immediate rehabilitation of the site, community development and management plans, a complaints resolution process and half-yearly independent audits. Brisconnections won the bid to build the controversial tunnel in May 2008. The win also entitles them to operate the tolled tunnel for a 45 year concession period. Brisconnections is a consortium of Macquarie Capital Group, Thiess, and John Holland. The latter two are independent subsidiaries of Leighton Holdings Group and are jointly responsible for project design and construction. The Coordinator-General approved the initial project in July 2008. There will be two parallel north-south tunnels linking East-West arterial road at Toombul with the Inner City Bypass at Bowen Hills with an exit at Kedron linking Gympie and Stafford Roads. In evaluating the Wooloowin change request, Jensen considered three factors: a) other alternatives, b) cost-benefit analysis and c) management of adverse impacts. Jensen sought advice from independent expert Graeme Peck of GM Peck and Associates. Peck told Jensen the request was the only “reasonable probability” of ensuring the project met the original completion of June 2012. “This means that the benefits of the project to the Brisbane traffic network and hence the community as a whole will be available when expected,” Peck said. Jensen said all other alternatives would have delayed the project by eight months. According to Jensen there were “no better feasible alternative(s)”. On the second point he noted the benefits of congestion improvement, employment opportunities and community benefit versus the impact of delay to the project if the change request did not go ahead. He said it was “reasonable to assume” the benefit would outweigh the $35m estimated cost. He then addressed the mitigation concerns acknowledging negative impact due to the new worksite. Jensen said that local business ambience and customer comfort would suffer from increased dust, noise and vibration. He recommended a one-way construction traffic route to minimize spoils and haulage impacts and vehicle monitoring to ensure the route was followed. He also banned haulage vehicle queuing near “sensitive” places including residences. All site workers would arrive via shuttle buses from the existing Kedron worksite. Jensen also placed conditions on the acoustic barrier for noise mitigation and all generators and associated equipment must be enclosed. The report also made recommendations on dust, air quality, groundwater, contaminated lands, and flora and fauna. No one has claimed responsibility but there are plenty of enemies to al-Maliki’s Shi’ite regime with reasons to carry out the atrocity. Al-Qaeda, the Sunni Sons of Iraq, ex-Ba’athists, Kurds and Shi’ite extremists all had motives to discredit a government asserting Iraq’s increasing independence. The still-large American military presence also rankles. The government was due to meet yesterday to discuss laws to govern January’s proposed general election. The meeting did not happen and the blast has put further doubt on the poll. The street where the blasts occurred had just been reopened to vehicle traffic six months ago as the regime attempts show Iraq is getting back to normal. This new “normal” is very different than what passed for run-of-the-mill in Baghdad prior to 2003. The US has turned the old order upside down. Democracy has given the more numerous Shi’ites power and the old Sunni Ba’athist elite are disgruntled. They boycotted the 2005 election and may do again in 2010. There are also issues on the Kirkuk faultline of Arab-Kurdish relations. The International Crisis Group has nominated Ninewa as the new flashpoint with violent sectarian attacks commonplace in a town which is mainly Arab with a large Kurdish minority. Finding a sustainable solution to Kurdish disputed borders is one the fundamental problems threatening Iraq. The country was founded as an artificial construct after Britain cobbled together three Ottoman provinces to give to a deposed Saudi king after World War One. Strong Sunni leaders papered over the cracks for 70 years. ICG’s Middle East Program Director Robert Malley says a compromise won’t happen without an assertive American role. “The US might be on its way out, but its hands will be full even as it heads for the exit,” he said. As Vice President Biden reiterated in September, the US “recognises and supports” a united Iraq. But Afghanistan is the now only overseas war-game in town and the US is anxious to withdraw large-scale forces from Iraq. There are still more US troops in Iraq than in Afghanistan and General McChrystal wants them badly. For the first time since the Iraqi war started, US Coalition forces deaths are higher in Afghanistan than in Iraq this year with three times as many casualties to October. The Afghan numbers are not yet as high as figures for the early years of the Iraq war but have been on the increase since 2003 so things will get worse there. The Afghan presidential run-off election will dominate headlines but the Iraqi poll has the potential to be even more traumatic. As The Guardian puts it, politics of compromise and national unity in Iraq are fragile and slow-moving. The political system has been simply been unable to overcome traditional challenges leading to an inevitable consequence of violence. Iraq’s same old “issues of oil, federalism, provincial borders and reconciliation [are] still festering”, says The Guardian. 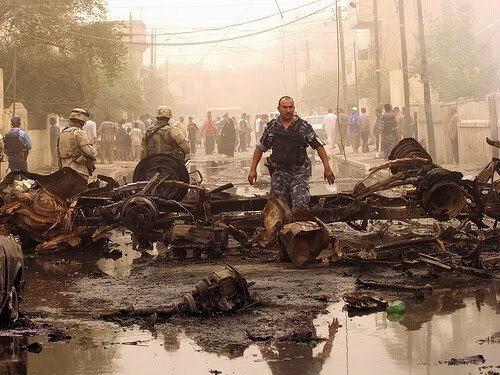 Expect more bombs in Baghdad until these challenges are addressed. The entire affair seems overblown given how irrelevant the BNP are. The party won 10 percent of the European election vote in heavily working class areas where the Labor Government is on the nose. Its overall vote was actually down on the 2004 election. It is likely many of this year’s protest votes will swing back at the next general election. 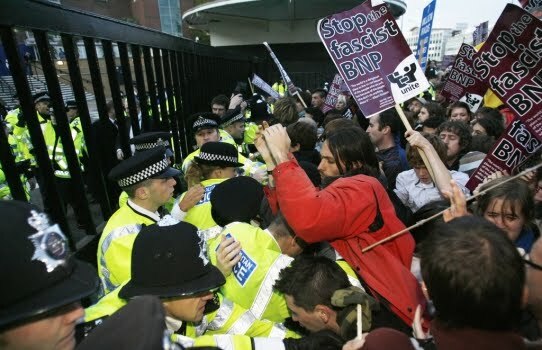 The BNP are a lunatic fringe for the disaffected with few coherent policies. It’s now illegal membership criteria requires all members be part of the “Indigenous Caucasian” racial group (based on looks alone) and want everyone who is not so Aryan to go “home”. Membership of the party is currently closed while apparatchiks write a new constitution to be presented to members for acceptance. The BNP’s limited appeal is based (as was the National Front of the 1970s) on the notion Britain is being “swamped” by “others”. The party will never win an election or gain any sort of power. While their views might be repugnant, they give voice to the frustration of many who want to blame someone else for their own inadequacies. What the controversy really showed is the immense power of the national broadcaster. Popular media such as the BBC can amplify any subject matter. According to www.ranking.com, bbc.co.uk is one of the world’s 25 most used websites and the second most accessed news site (after CNN). Its British television stations remain hugely influential and eight million people watched Thursday’s episode of Question Time which featured Griffin and other British politicians including Labor Lord Chancellor Jack Straw. In Britain there has been a strong tradition of public ownership of media going back to the invention of broadcasting in the 1920s. The BBC was created with a government-appointed board of governors and funded by an annual licence fee. Under John Reith the BBC established a high-minded tradition that eschewed the position of the popular tabloid newspapers in favour of high culture. Committed to the avoidance of sensationalism, it did not hire its first newspaper journalist until 1932. According to Michael Schudson the BBC forbade discussion of birth control in the 1930s and 1940s under its government-regulated monopoly. In the face of changing social values and competition from ITV in the 1950s it was discussed along with divorce and other controversial topics. Competition gave the BBC something to worry about other than their political paymasters. The BBC rose to the new challenge with a topical political question-and-answer radio program. “Any Questions?” started on the Home Service in 1948 and runs to this day. The program was stopped for 10 minutes in 1976 when far-right politician Enoch Powell appeared and anti-fascist protesters threw bricks at the church where the show was recorded. Three years later, the format was tried on television as Question Time. Three panel members from each of the main parties were joined by a non-politician to face questions from the audience. In 1999, a fifth panel member was invited either from the minor parties or another non-politician. Over 30 years the show has become Britain’s flagship political panel show. The BNP have been persona non grata until their recent European and council victories. When Griffin finally appeared on the show, it was almost an anti-climax. The BNP leader was sensible enough to leave his more outrageous opinions in the dressing room and he tried to steer a course of sensible reaction to an immigration crisis. Like most politicians he used as many words he could to say as little as possible. He claimed he was a “moderniser” who simply wanted to end immigration. He was also nervous and the target of intense questioning and jeering from the crowd. Griffin will probably feel the pain of these pinpricks is worthwhile and the BNP will gain traction from his appearance. The party’s issues will temporarily get on the agenda. Many will sympathise with the way Griffin was torn apart on the program and others will react positively to his racist message. Nevertheless the BNP will always be a fringe party handicapped by Britain’s first past-the-post election system. The BBC was right to allow him on Question Time. Broadcasting asserts a right to public access. By encouraging more people to keep informed it encourages more participation in public life. More participation will likely mean more unsavoury voices in the public sphere but it is crucial they be heard. Anything less is toxic to democracy. Media writer Margaret Simons was the guest for the final Wordpool event of 2009 at Brisbane’s State Library of Queensland (thanks to Mark Bahnisch for the hat tip on the event). Simons is the author of the seminal text on Australian media The Content Makers (2007) and runs a blog of the same name under the Crikey banner. The Melbourne-based Simons reminded her audience of her close affinity with Brisbane having been here often since The Age assigned her to cover the Fitzgerald Inquiry 20 years ago. Simons began with a history lesson and charted the influence of the Gutenberg printing press. This revolutionary device effectively created democracy and modern capitalism. The movable type press was invented in the 15th century but it took another 200 years before newspapers emerged and almost another 100 before the first journalists arrived. The printing press altered power relations and caused the decline of oral memory. It enabled people to identify themselves belonging to nations rather than small communities. It caused the Reformation and the rise of Protestantism. It sowed the seeds for the American and French Revolutions. These trends were exacerbated by broadcasting in the 20th century. Simons says the Internet has the same revolutionary capability as the printing press. Its disruptive effect won’t be noticed overnight. Simons recalled what journalism was like when she started in the business 27 years ago, in an era without computers or mobile phones. The newspaper buildings had a manufacturing air with the smell of hot metal and ink and the rumbling of the presses. She recalled people would queue out outside the building at midnight to get the first edition. Ruefully she said, they were not there for the journalism; they had come to get first nibs at the classified ads. But the classified ads model that sustained newspapers doesn’t work on the Internet. Free services such as Craigslist have destroyed the business model and ads don’t pay for journalists’ salary any more. Simons also noted journalists’ power has declined in the Internet Age. Their influence has waned with the power of the masthead and the Page One headline does not matter as much as it did 20 years ago. Similarly the power of television has waned. Families no longer sit together to watch the 6pm news. 68 percent of Australian households have more than one television and a quarter of all households are single occupancy. This fragmentation undermines the business model that relies on gathering mass audiences to sell to advertisers. The business model is broken. And when high-speed broadband arrives, the last power of the broadcasters will have been broken with it. Simons discussed ABC boss Mark Scott’s recent “end of empire” speech. She was cautious about whether this was a good or bad thing noting the Life of Brian skit about “what have the Romans ever done for us?” Similarly old media such as News Corp have facilitated democracy, employed large numbers of people, acted as watchdogs and informed the public. She also noted the end of the Roman Empire brought in the Dark Ages and similar dark times might lie ahead for journalists. The big change in the Internet era, said Simons was universal instant access to information and publishing. With mobile phones, people could (and did) Twitter this speech immediately – she helpfully suggested the use of the #wordpool hashtag. Simons said Twitter was now a crucial tool for deciding what to read or watch. The question was then, if everyone is now a publisher, what do journalists do that is “special”? Simons said journalists had to specialise in things they are interested in. The barriers to publication are low and it is possible to attract international audiences and advertisers willing to pay to access niches. She noted the long tail model as perfected by Amazon who make most of their money from niche audiences. She said Crikey was a good example of niche media with its email list of 10,000 people. Its audience is small but influential and Simons could delve into more detail about the media there than in a mass publication because the audience is interested in that detail. Simons said journalists must engage with social networks. They needed to show reliability, genuineness and a willingness to interact. Twitter, Facebook and Google may come and go but the functionality they represent will stay. She said Twitter was moving fast and her advice was “get on board now”. She noted the appetite for news has not waned though people may be looking in different places for it. Australia is a chronically underreported country and opportunities exist in reporting local councils and courts. What journalists need to do is to link these to federal and local government policy and make the connections. The bottom line was if people want reliable information then “professional messengers need to be supported”.